Tara is a Direct action hand pump with a vlom concept. Entire above the ground mechanism is of steel construction, hot dip galvanized to prevent from rusting. Tara ( Direct action hand pump) is suitable for lifting water from bore well with static water level not exceeding 15 meters. The cylinder assembly consists of cylinder pipe, piston, piston rod, food valve receiver, it provides necessary pumping action and lifts water upward through rising mains, the pump rod assembly provides linkage between pump handle and piston in cylinder, with its light weight and high displacement capacity, these rods are buoyant and help in reducing the effort required during upward stroke. The rising mains carries water from cylinder to pump. 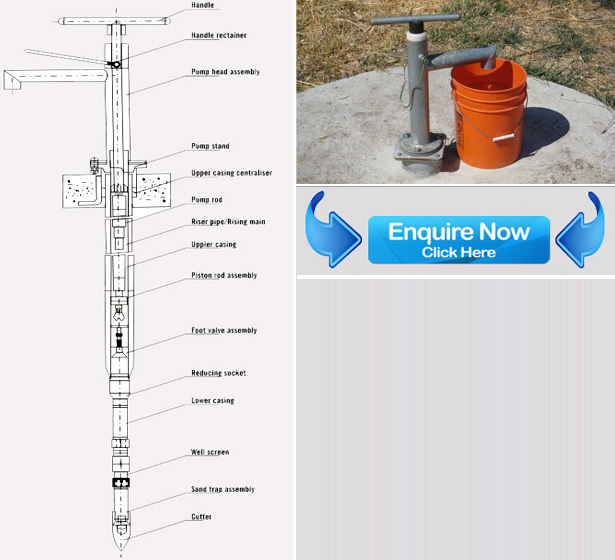 The Direct Action hand pump is supplied along with a special type of combination spanner required for installation and maintenance and also a retrieving rod which helps in extracting foot valve assembly from cylinder for village level operational maintenance by communities.